"CNC Machining with ZW3D Tool"
The ZW3D tool path editor is not only a simple editor, it involves many more tools to fulfill any designers' wants and needs including -gouge detection, tools check, tools life extension, surface quality. Have you ever gone through a lot of trouble adjusting the parameters, simply to get the appropriate tool path editor? Do you long for a way to edit the tool path in CAM simply like you edit parts in CAD, allowing you to create the right tool path without complex operations? If this is a problem you can recognize, then this white paper may interest you. 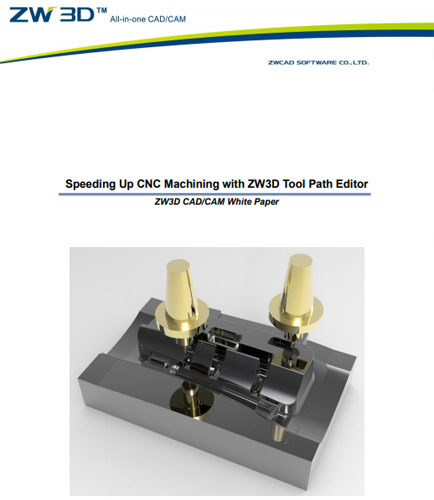 Read this whitepaper “Speeding Up CNC Machining with ZW3D Tool Path Editor,” to know about - how ZW3D Tool Path Editor can help you to greatly reduce programming time makes it simpler and smarter to produce a perfect tool path for machining.